CCC 2559: "He who humbles himself will be exalted; humility is the foundation of prayer, only when we humbly acknowledge that 'we do not know how to pray as we ought,' are we ready to receive freely the gift of prayer. 'Man is a beggar before God.'" If you've been reading this blog for more than a month or two; or, if you've come to me for confession; or, if you've asked me for spiritual direction; or, heard me preach; or, bumped into me at Popeye's Fried Chicken. . .then you know I have One Thing to Say About Prayer: gratitude, gratitude, gratitude. Nothing builds humility like gratitude. And nothing produces gratitude like the generosity of others. Therefore, your generosity makes my humility possible. . . Thus, making my prayers for you all the more efficacious! Over the years (since 2005) HA readers have sent me books via the Wish List. Literally, hundreds of books. For a while there in the early days of HA, I was receiving two or three books a day for weeks. This sort of mendicancy has caused a few raised eyebrows. A former prior (may he RIP) called me "Shameless!" He smiled when he said it. . .but I always got the feeling that he meant it just a little. Others in the Order have called me out for seeking "personal donations." And still others have protested that begging for books is gauche. I've never wavered. Why? Several reasons: 1) I need the books; 2) My book budget is tiny compared to my need; 3) Offering opportunities for others to share in the preaching ministry is the Dominican Way; 4) Priory libraries tend to be small and dated; 5) more often than not I donate books I've used to priory libraries; 6) and the chance to be grateful for the generosity of God's People is too good to pass up! SO. . .Thank You Thank You Thank You for your generosity, your kindness, your willingness to participate in the preaching ministry of this Dominican friar! Three umpires walk into a bar. . .
Three Major League Baseball umpires are sitting in a bar, having a drink. They start discussing their philosophies of umpiring. 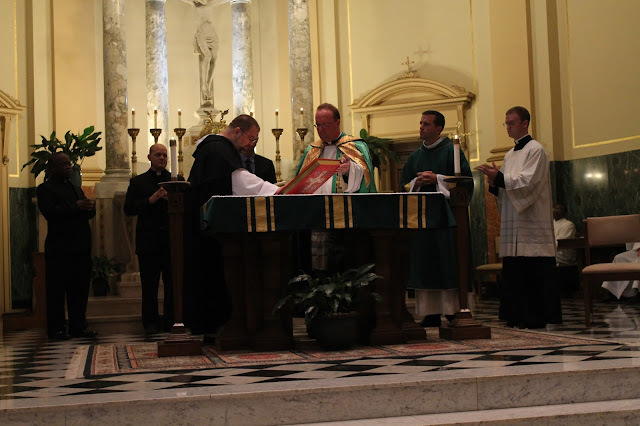 . .
Jeffrey Tucker offers an appreciation of priests. . .frankly, I get up every morning thanking God that He called me to this life, and I remain in awe of the generosity I've experienced from Catholics all over the world! J.T. points out that Catholics tend to expect their priests to be On Hand and Ready at a moment's notice to provide spiritual insight, pastoral care, and intelligent advice. Yup. That's exactly what we signed on to do. If someone asked me to stand up and say something intelligent about the day’s readings, I would sweat it out and probably flop. Most people would. And yet we somehow assume that the talent to do this is built into the genetic code of a priest—and if he ever fails, he will certainly hear about it. Paul confesses to Timothy that he persecuted the Church “out of ignorance.” He describes himself as a blasphemer, “an arrogant man.” He could've added: zealot, ideologue, and murderer. He could've called himself a scourge, a curse. And no follower of the Way who knew anything at all about the infamous Saul of Tarsus would've disputed him. But rather than lengthening this litany of sin, Paul turns instead to the one thing, that single thing that brought him out of his arrogance. He writes, “I acted out of ignorance in my unbelief. . .but I have been mercifully treated.” Despite the blood on my hands; despite my hatred and my zealous persecution of Christ's church, God showed me mercy. And, perhaps even more incredibly, my brothers and sisters in Christ showed me mercy. Though they still remember, they always forgive. The strength of our love and wisdom—given by God and received in faith—is measured by the swiftness of our mercy, the joy we experience in releasing another from the debt of sin. But how can I see my way to forgive you your debt if my own debt obscures my vision, clouds my judgment? Before passing judgment on your neighbor's debt, check your own balance and make you sure you've measured with charity. The gift of mercy we give one another is possible only b/c we are given mercy to spare; that is, the mercy we receive from God is given in excess, in abundance, out of His excellence, and it's this surplus-nature of divine mercy that moves us to mete it out with abandon. If we find ourselves unable or unwilling to freely grant mercy to a sinner, then it's likely we ourselves are being held hostage by sin. Jesus says, “Why do you notice the splinter in your brother’s eye, but do not perceive the wooden beam in your own?” Why? Probably b/c my wooden beam is preventing me from accepting God's forgiveness. Unless I am willing to name my sin, confess it, offer contrition, and do penance, that beam will obscure my vision and cloud my judgment. Sin speaks to the heart of a sinner. So, my beam recognizes your splinter and neither my beam nor your splinter will free us to receive mercy. The only way out is to turn to Christ for some Sin Surgery! Afterward, you and I will share some post-op discomfort but mercy is divine medicine and the Church a skillful nurse. Look to Paul as our example. He regrets his former life as a bloody persecutor of the Church. He laments his past to Timothy, freely acknowledging his arrogance, his ignorance, his unbelief. But the point of his letter is not self-flagellation. Yes, he's confessing, but he's confessing with the full knowledge that his sins have been forgiven through the grace of Christ Jesus. Forgiven, not forgotten. So the point of his confession then is to bear witness to God's mercy. He is testifying to the power of mercy to heal the most traumatic wounds, to bring peace out of conflict, to grant wisdom when all we really want is payback. Look what mercy—God's love and the Church's—did for Paul. He is humbled. He is enlightened. He is strengthen for his mission. He finds the courage he needs to face his enemies on the road, and he is built up as a traveling tabernacle of God's presence. Not only is he freed from the burdens of his past, he is also perfected for the future Christ's has given him. None of these is even remotely possible w/o mercy. If we hope to grow in holiness, to grow in wisdom, the first step is receiving—freely receiving—the mercy God offers us through Christ. Then, we become diffusers of mercy, strengthening one another, and giving thanks to God. POPE SAYS BELIEF IN GOD NOT NECESSARY FOR SALVATION! Both of these headlines and their accompanying articles are gross misreadings. In fact, if you wanted to study how the anti-Catholic bigots of the MSM choose to misrepresent the Church's teachings, you couldn't find better examples. Fortunately, Fr. Z. saved me the work of parsing these ridiculous excuses for journalism. The Vatican's new Secretary of State said nothing new about the discipline of clerical celibacy. The Holy Father did not say that belief in God was irrelevant to one's salvation. The inability/unwillingness of the MSM to get Church-stuff right is simply astonishing. Catechism: can you pass the test? Take the Catechism test! Below you will find a practice exam that I gave my pre-theology Catechism class. Catholics will often express ideas about the faith that are ambiguous; that is, they have a grip on some small part of the truth but let the whole truth fly away. This test challenges you to use the Tried and True Method of Thomas Aquinas to ferret out the ambiguities and clarify each statement. NB. these statements cover roughly paragraphs 1-141 of the CCC. All of the statements below are ambiguous. As a theologian, your task is parse each statement in such a way that it unambiguously expresses a truth about the faith. Refer to the CCC for the appropriate language. REMEMBER: never deny; rarely affirm; always distinguish! 1. God created man out of necessity. 2. God sent His Son as our Redeemer to save us from sin. . .whether we want to be saved or not. 3. The human desire for God is something that we cultivate over time. 4. We can find truth and happiness most anywhere. 5. Natural reason tells us about God. 6. Our language about God is limited, so we really can't say anything true about Him. 7. The CCC says, “We must therefore continually purify our language of everything in it that is limited, image-bound or imperfect. . .” (42). This means that we shouldn't use male pronouns and images to depict God. 8. The CCC says that God “creates and sustains” all of creation. This means that God and creation are basically the same. 9. God is constantly revealing Himself to us through scripture, Christ, and created things. 10. The apostolic tradition gave us scripture; therefore, our bishops can decide what's true and false in the Bible. 11. All truths of the faith are equally important to our salvation. 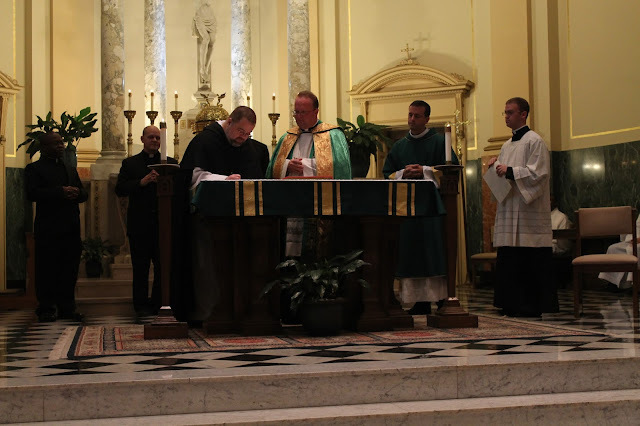 Two pics of me signing the Oath of Fidelity on the altar of Notre Dame Seminary's chapel during Solemn Vespers, August 26, 2013. That's Fr. James Wehner, seminary rector, to my left. 2. A priest in France has attracted people to packed Masses largely by spending six hours every night in the confessional. (He also wears priestly garb on the street so that those who want a priest know where to find one.) Clergy here need to recommit themselves to the sacrament of confession. They must be available at convenient times for more than a perfunctory half-hour before Saturday evening Mass. Frequenting the sacrament themselves, priests can awaken in their parishioners the need for repentance and conversion. 3. A pope once said that one good catechist is worth a hundred outstanding preachers. Yet there are wealthy parishes that expect directors of religious education to work as unpaid volunteers! Catechism needs to be taken more seriously as a ministry [AMEN! And not that goofy Feelings-Are-All-That-Matter nonsense from 1973. But real, substantial, Total Catechsis.]. In many parts of the world, the minister whom Catholics see the most is their catechist, not their pastor. Parents must be willing to be trained and work as catechists. More adult Catholics must also take responsibility for handing on the faith. This also includes shouldering ministries that care for the least, such as visiting the sick. Both will make their way into the classroom at NDS next semester! I always think of this Gospel reading as “the one that makes me squirm.” I'm sorry, but you don't just tell a southern boy that he must hate his mama in order to love Jesus. That sets up a cognitive dissonance that might just explode his head! So for years I did what most good church folks probably do when this reading came along at Mass: I let the sharpness of it, the bluntness of it slide right off and chose to hear it all as more of Jesus' famous hyperbole. He's just being dramatic so that people will listen to him. He really doesn't mean that I have to go home and tell mama that I hate her, but it's OK b/c I love Jesus. (I'm not sure I'd survive that conversation!) This Gospel reading is difficult. It's difficult b/c it cuts right across what we think being a Christian is all about, and to take it seriously, literally would mean having to radically rethink what it means to follow Christ. Well, what's so bad about rethinking what it means to follow Christ? What's so bad about letting Christ shine a little light on how we've come to follow him? Sure, it might cause some squirming but it might also bring us closer to the holiness we all desire to achieve. There's comfort in our faith; I mean, there's a aura of certainty, calm, security in the religion we practice. We have rituals, liturgies, prayers, doctrines and dogmas, churches. 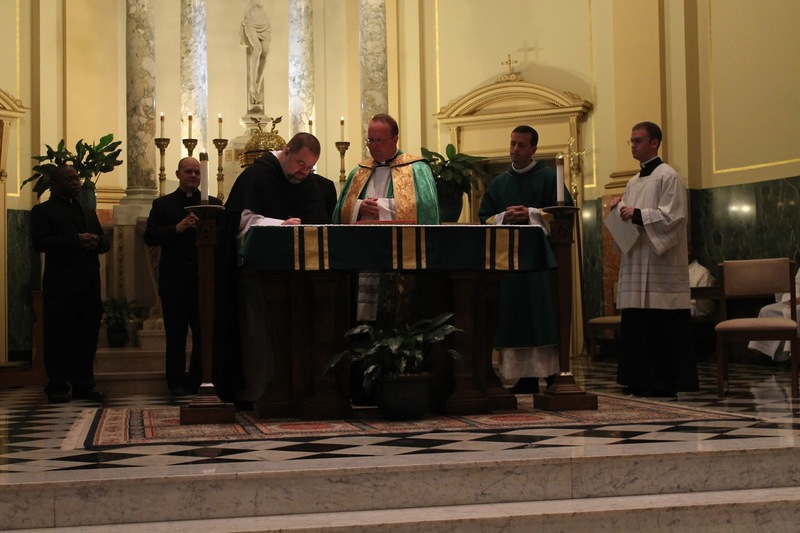 Sacraments to ensure that we receive the graces we need. We have a long, venerable intellectual tradition, reaching back 2,000 years. We have a heavenful of saints cheering us on. Angels and archangels watching over us. Clear, uncompromising moral guidance. In fact, we have it all, in its fullness; we have everything we need and probably most of what we want when it comes to a religion. Loving God, loving mother, parish family, not to mention we have it all right here in New Orleans! But here's the problem: none of what we have, religiously speaking, is worth much if we are not first and last disciples of Christ; that is, if we love anything or anyone more than we love Christ, no amount of religion is going to bring us to holiness. Now, each sacrament, every prayer, all of our fasting and sacrificing, everything we do as Catholics is meant to help us along the path to holiness, following along behind the Lord. But if we are not learning at the feet of Christ; if we are not his committed students in the school of charity, then nothing can help us until we first choose to move out of the crowd and come into his presence. Now, please hear what I'm saying. To put it into theological language: we must be properly disposed by faith, hope, and love before anything the Church has to offer becomes efficacious for our holiness. To put it plainly: if you aren't ready to be holy, nothing the Church can give you is going to make you holy. So, let's ask some uncomfortable questions. What do I love more than God? (My life, my house, my career?) Who do I love more than God? (My spouse, my parents, my kids?) What crosses have been handed to me? (Sickness, poverty, temptation?) Will I pick them up? Do I have the courage to carry them? What possesses me? (A spirit of ambition, anger, vengeance? Addition, debt?) Who owns me? (My friends, colleagues, in-laws?) At whose feet do I sit to learn what I need to know? (Pop-stars, Hollywood actors, politicians, TV preachers?) Am I strong enough and courageous enough to handle my failures w/o help? Am I wise enough to celebrate my successes w/o celebrating them with others? Where else am I going to get the grace I need but in my love for Christ and the ministry of his Church? There is no where else for us to turn if holiness is our goal and this world is the world we must travel through. Being a student of Christ in his school of charity has consequences. No per-requisites, no conditions but lots of consequences. Jesus says, “If anyone comes to me without hating his father and mother, wife and children, brothers and sisters, and even his own life, he cannot be my disciple.” This may sound like a condition, a per-requisite but it's actually a consequence. We cannot be true disciples and be unprepared for the consequences of following Christ. The hard truth, the truth that the history of Church's martyrs bears out, is that following Christ often means loss. Loss of family, loss of livelihood, even loss of one's life. If we love anyone or anything more than we love Christ, then these losses become unbearable, and we risk losing not only our holiness but our eternal life as well. When Jesus says that we must love him before we love mother, father, children, and self, he means that we can only love them and ourselves, truly love, b/c we have loved him first. Their loss, though devastating, will not destroy our first love. And it is this first love that brings us through to our holiness and our final perfection. Being a diligent, faithful student of Christ in his school of charity has consequences, eternal consequences. Being a diligent, faithful disciple of Christ also has temporal consequences, good effects right here on earth. First, the sacraments we celebrate work brilliantly to see us fed with the graces we need. Second, our prayers sharpen our gratitude and we grow in humility. Third, our ability and willingness to show mercy and live in peace is fortified. Fourth, our generosity is rewarded with abundance, and our attachment to the passing things of this world is loosened. Fifth, our struggles with temptation give way to the reality of Christ's victory over sin, and what temptations we have are more easily dismissed as illusions. And lastly, we become more and more like our Teacher: more loving, more sacrificial, more peaceful, and more certain than ever that we walk the path to our death with the Father, hand-in-hand. What comfort and security our religion can bring us is only comfortable and secure b/c we have prepared ourselves to be comforted and secured by first being faithful students of Christ. Love him first, then all others. And nothing we can lose will ever lose us the love that saves us. Have we surrendered our catechesis to the Enlightenment? Caution: this post is a bit of a Ramble. . .I'm thinking something through. In a post below I wrote: "All of this means that we need a workable apologetics; that is, a means of teaching, defending, and living the faith that doesn't adopt modernist assumptions about truth, beauty, and goodness; or simply concede to the Enlightenment its definition of reason." The idea expressed in that sentence was prompted by a book I've been reading titled, The End of Apologetics: Christian Witness in a Postmodern Context by Myron B. Penner. Penner argues that most contemporary Christian apologetics fails in teaching, defending, and living the faith by adopting an Enlightenment understanding of reason, a move which logically requires conceding to modernist epistemological standards of evidence/truth. What does this mean? Basically, it means that (for the most part) we have surrendered the public presentation and defense of the faith to the 20th/21st century heirs of our 16th/17th century enemies. We're playing on their home field by their rules. It means that we've conceded that Christian truth is largely a matter of propositional statements that can and should be vetted by natural reason according to the rules of logic and empirical method. Penner points out a number of unfavorable consequences of our surrender. Chief among these is the loss of mystery, properly understood. Another loss: the ability to translate biblical teaching into our daily lives. How are we supposed to live the Gospel when it has been reduced to a set of logically defensible propositions? Penner's solution is problematic for a Catholic. He suggests that we abandon the Enlightenment Project of rational justification and its monstrous offspring, empirical evidence gathering, and choose instead to teach, defend, and live out our faith as a matter of hermeneutics; that is, we approach scripture, doctrine/dogma, etc. as meaning-making narratives that tell Our Christian Story. He suggests that we replace the Enlightenment model of truth -- "propositions corresponding with reality" -- with a uniquely Christian model of truth: "existential edification." Rather than defending the Incarnation as a logically consistent description of reality, we live out the Incarnation as way of making sense of our belief that we are human creatures destined for union with God. I am sympathetic with Penner's critique of modern apologetics b/c too often we concede to empirical science its standards for evidence and reason; for example, 20th century attempts to defend transubstantiation using scientific methods and tools, which always end with our surrender to the modernist idea that reality is basically physical and only physical. In a recent blog post, Msgr Charles Pope reports on his efforts to restore a living catechesis to his parish. He calls his approach "Whole Family Catechesis." I'm not sure if he knows that he's challenging modernist standards of truth and evidence, but the way he describes what he's doing seems to indicate that he has intuitively grasped that the propositional approach is largely fruitless. When leading a Bible study or teaching a scripture class, I tell the students that all facts are true but not all truths are factual. Some truths can be told and understood outside the limits of facts.